Wooden barrels have been used since ancient times. Barrels have been part of American life since the beginning of European immigration. Our first barrel maker came over on the Mayflower. Barrels were fairly cheap, reusable, strong, crushproof, weatherproof, watertight, somewhat tamperproof and could be stamped or branded with the content information. They could be rolled by one or two people. 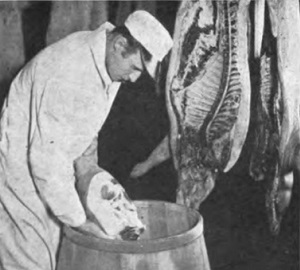 Since early food preservation depended on salting and fermentation, many products could be manufactured in the same barrels they were shipped in. Bags and wooden boxes were the main competitors in pre-industrial America, but had few of these advantages. 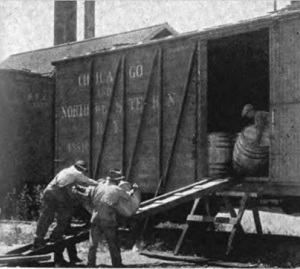 Barrels were essential for Chicago’s early industries as well. The city directory shows that in 1843 Chicago’s port exported 36,234 barrels of pork, beef, flour, lard and tallow. Imports included 27,038 barrels of salt (essential for producing barrels of salt pork and beef), 2,585 barrels of whiskey and 57,000 barrel staves. Staves are the wooden planks used for the long part of the barrel. The size of barrels varied, but likely most of the barrels were of a size known as a tierce, or about 42 gallons—the size of a barrel of petroleum or salt. A 42-gallon barrel of salt would weigh about 400 pounds. Increased industrialization and transport throughout the 1800s and first half of the 1900s only increased the demand for barrels. In addition to the old standbys of meat, flour, salt and whiskey, newly mass-produced commodities were shipped to and from Chicago in millions of barrels. Examples include apples, peaches, pears, potatoes, beer, horseshoes, nails, cement, tar, crude oil and chemicals. Barrels also lent themselves to highly specialized uses such as surviving a plunge over Niagara Falls and the U.S. Navy's first submarine. Cooperage, or barrel making, which had long been a hand craft, became highly mechanized as oil production started in Pennsylvania in 1859. The U.S. didn’t have enough barrels to transport all of the oil produced. We started importing empty barrels. Within a few years oil began to be shipped in tank cars, but originally these were just gigantic wood barrels mounted on rail cars. 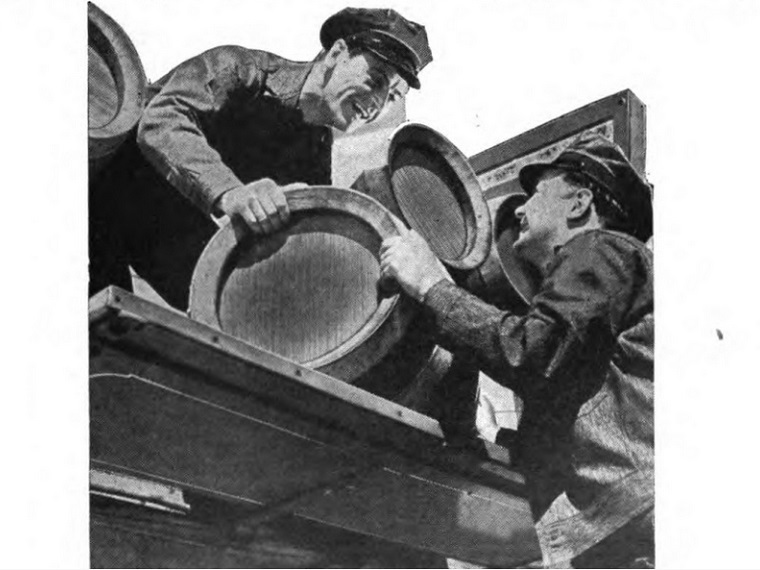 With mechanized barrel production came specialized categories. Notably “slack” and “tight” cooperage. Tight cooperage was used for liquids and was made from straight, knotless white oak. Beer barrels had the most demanding standards. They had to hold both pressure and liquid, so they were lined with pitch and made of thicker and choicer wood. Slack cooperage used less choice wood and held dry items such as fruit and cement. Hoops were made from hickory, elm, steel, iron or wire.